Own a business? Are you in marketing or sales? Hell, are you in a band? You need to hire a mobile website developer ASAP. Here’s one reason why. As website developers in Atlanta, we make sure that our client’s can get found in search, no matter what device is being used. Whether it’s through a mobile website, or iphone application, we provide a digital presence that is engaging and will convert visitors into customers. Needless to say, we were stunned by what we saw on our iPhones. 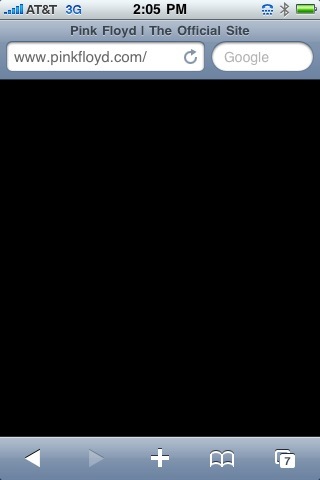 A black screen, with no content at all. Nothing. Personally, I love Pink Floyd. I grew up listening to them and have traveled to the 4th dimension many times while listening to their music. But when a band as enormously influential and powerful as Pink Floyd doesn’t have a mobile website – in this day and age, the generation gap becomes painfully obvious. Do you know that half a billion people used mobile search last year? That number is expected to double in the next 5 years as mobile overtakes the PC as the most popular way to get on the Web. Need more reasons to hire a mobile web developer? Google has a separate index for mobile content. Another way to get found in search. 1/5 of Americans access the mobile web each day. $1.6 billion purchased from mobile devices in 2009. There are an estimated 2 billion cell phones worldwide. Pink Floyd…I’m talking to you.